Last week, as I was preparing my sermon for the Day of Pentecost [24 May 2015] in Christ Church Cathedral, Dublin, I found my mind wandering between Elam in remote Persia in Apostolic Days to Ilam in the Staffordshire Peaks and my wanderings there in my late teens in the early 1970s. But in a conversation yesterday, someone confused picturesque Ilam (pronounced Eye-Lamb) in Staffordshire with the “plague village” of Eyam (pronounced Eem, to rhyme with seem), about 40 km further north in the Derbyshire Peaks. I visited Eyam later in the 1970s while I was attending peace conferences at Swanwick and went on tours that also brought me to neighbouring places like Bakewell, Buxton, Chatsworth, Chesterfield and Matlock. Years later, Eyam still tells a memorable tale from the 17th century of self-sacrifice and bravery that remains an outstanding and unique story of redemptive self-sacrifice. It is a story that I am often reminded of in Lichfield when I hear the stiry of Anna Seward and her poetry. Eyam is a village in the Derbyshire Dales and in the Peak District. The village is noted for an outbreak of the plague in 1665, when the villagers chose to isolate themselves rather than let the infection spread. Eyam was also badly affected by the Great Plague of 1665, although the plague is usually associated with London. The sacrifices made by the villages of Eyam is said to l have saved many places throughout the Midlands and northern England. At the time of the plague, Eyam had a population of about 350. The most important person in the village was the Rector, the Revd William Mompesson (1639-1709), who moved to Eyam with his wife Catherine and their children in 1664. In the summer of 1665, the village tailor received a flea-infested bundle of cloth from his supplier in London. This parcel contained the fleas that caused the plague. Within a week, the tailor’s assistant, George Vicars, had died from the plague. More began dying in the household soon after; by the end of September, five more villagers had died; 23 died in October. As the plague spread, the villagers turned to their rector and his predecessor, the Revd Thomas Stanley. When some villagers wanted to flee to Sheffield, Mompesson feared they would bring the plague with them and persuaded them to cut themselves off from the outside would. From May 1666, precautious measures were introduced to slow the spread of the plague. Families buried their own dead and church services were moved to the natural amphitheatre at Cucklett Delph, allowing villagers to separate themselves and reduce the risk of infection. The villagers voluntarily quarantined themselves although this would mean certain death for many of them. The village was supplied with food by people living outside who left supplies at the “plague stones” marking the boundary that separated Eyam from the outside world. The villages left money in a water trough filled with vinegar to sterilise the coins. In this way, the people of Eyam were not left to starve to death, and the people who supplied the village with food did not come into contact with the plague. Eyam continued to suffer from the plague throughout 1666. William Mompesson had to bury his own family in the churchyard. When his wife died in August 1666, he decided to hold her services outdoors to reduce the chances of people catching the disease. By November 1666, the plague had come to an end. In all, 260 out of 350 villagers had died in Eyam. But their selfless sacrifice saved many thousands of lives in the north of England. The plague ran its course over 14 months but when it came to an end it had killed most of the villagers. The parish records provide the names of 273 people who were victims. Only 83 villages survived out of a population of over 350. Those who survived did so randomly and there is no explanation for their survival. Many people of the survivors had close contact with those who died yet never caught the disease. Elizabeth Hancock buried six children and her husband within eight days, but was never infected herself. The village gravedigger Marshall Howe survived even though he handled many infected bodies. Every Plague Sunday a wreath is laid on Catherine Mompesson’s grave in the churchyard. 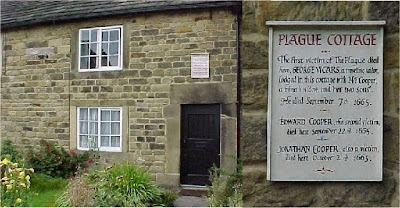 Plague Sunday has been marked in Eyam since the bicentenary of the plague in 1866. It now takes place in Cucklett Delph on the last Sunday in August, at the same time as Wakes Week and the Well Dressing ceremonies. 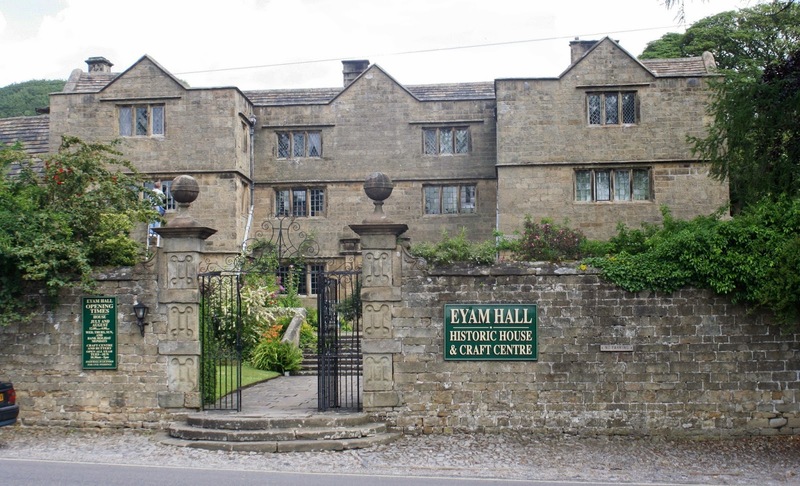 The Jacobean-style Eyam Hall was built by the Wright family in 1671, soon after the plague, and local mining helped Eyam to recover in population and to prosper economically. Today, many of the village houses and cottages are marked with plaques listing the names and ages of residents who died as victims of the plague, and the story of the plague village is told in Eyam Museum. There is a plague window in the parish church. But Eyam and its church and churchyard are much older than the plague. The name of Eyam comes from Old English and first appears in the Domesday Book as Aium. The name probably means a cultivated island in the moors, although it may also refer to Eyam’s location between two brooks. A Mercian-style Anglo-Saxon cross in the churchyard in Eyam dates back to the eighth century, and is covered in complex carvings. Saint Lawrence’s Church dates from the 14th century, but a Saxon font and Norman window are evidence of an earlier church on the site. Some of the Rectors of Eyam had colourful stories. The Revd Sherland Adams was an ardent royalist, and was removed from office by the parliamentarians, although he returned again briefly in 1664 after the Caroline Restoration and the resignation of Adams. The tithe from the lead mines was paid to the rectors, who received one penny for every dish of ore and 2¼d for every load of hillock-stuff. When a new rich vein was discovered in the 18th century, Eyam became a rich living. Canon Thomas Seward (1708–1790) was Rector of Eyam for half a century from 1740 until his death in 1790, and his daughter, the poet Anna Seward, who was born in Eyam in 1747. While he was still Rector of Eyam, he moved with his family 90 km south to the Bishop’s Palace in Cathedral Close in Lichfield in 1754, and became Prebendary of Pipa Parva in Lichfield Cathedral. To breathe her Handel’s soul-exalting lays. By hills and rocks, in savage grandeur rear’d. Swell my pain’d sighs, my tears spontaneous flow. From keen regrets of duteous fondness glide! Shall the long flight of future days restore! Now languid gleams, ’en when his friends are nigh. The social joys did their warm comforts breathe! Whose loss I left the childish sport to weep. Simple memorials of thy early dead! The dreariest relic of departed days. Dim Apparition thou – and bitter is my tear!